After a gruelling two and a half-months of back-to-back matches, the time has come for the summit clash of this season’s Ranji Trophy. The two finalists are Mumbai and Saurashtra, two teams which did not really look like potential finalists during the league phase, but they both have managed to up their game when it mattered most. The two in-form teams of the league phase, Uttar Pradesh and Punjab, fell by the wayside in the quarterfinals and the semifinals respectively. The final will be played from January 26-30 at the Wankhede Stadium in Mumbai. In the league match between the two teams, Mumbai scored a win on the first-innings lead easily. The most prolific team in the tournament’s history are yet again in a final – their 44th. The 39-time champions did not have the smoothest of times in the league stage – they won only one match outright, and that too by just 7 runs against Madhya Pradesh. They finished third in Group A with 23 points, level with their fellow finalists Saurashtra. In the final, Mumbai will be boosted by the presence of stalwarts like Sachin Tendulkar, Zaheer Khan and Wasim Jaffer. They are known to play their best in finals, as only 4 losses in 43 finals prove, the last being in 1990-91, when they lost to Haryana by just 2 runs. Mumbai also have the advantage of playing at their home ground, and will know the conditions well. Mumbai won rather easily on the first innings lead in the quarterfinals against Baroda, but in the semifinals, they prevailed over gritty Services only on the sixth (reserve) day, as a combination of poor weather and resistance from the opposition often threatened to thwart Mumbai’s march to the final. Their batting has peaked at the right time, with Wasim Jaffer back to prime form, and the likes of Abhishek Nayar and Aditya Tare scoring runs in almost every outing. Dhaval Kulkarni’s impressive bowling in the semifinal will surely hearten the Mumbai camp. I had predicted that Saurashtra without Cheteshwar Pujara and Ravindra Jadeja would falter in the semifinals against Punjab, but they proved me wrong in style, with a resounding 229-run win. Saurashtra also finished with 23 points in the league phase, second in Group A with just two outright wins. In the quarterfinals, they scored a win on the first innings lead over Karnataka. Pujara and Jadeja have been instrumental in Saurashtra reaching their first final in 75 years, but they will have to miss out the final match as well, thanks to the absurd scheduling of cricket in India (both are on national duty with the Indian ODI team). It was Saurashtra’s bowlers who starred in the semifinals though, with off spinner Vishal Joshi bagging 9 wickets. Saurashtra will no doubt be disappointed due to the absence of their two star batsmen in such a momentous match, but captain Jaydev Shah and Sheldon Jackson can more than pack a punch with the bat, as shown in recent matches. For the record, Saurashtra have never beaten Mumbai outright in a Ranji match. 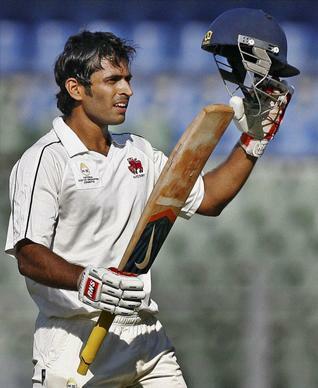 Mumbai – Abhishek Nayar, who has smashed 940 runs at 104.44 this season needs just 56 more runs to become this season’s highest run-scorer. If he continues in the same vein, he can not only help Mumbai to the title, but also stake claim for an all-rounder’s spot in the national team. Saurashtra – Sheldon Jackson’s form is peaking at the right time, and he will surely be banked upon to score big in the absence of Pujara and Jadeja. He has logged 742 runs this season so far and made an important 107 in the semi-final. This is his chance to be a hero. It will be a close game of cricket, and an outright result is a great possibility, unless the curator plays spoilsport by rolling out a belter. Mumbai have the edge, and I foresee a 40th Ranji title for them. But interestingly, I have earlier ruled out Saurashtra’s chances twice (of progressing to the quarterfinals and then the final), so I won’t be surprised if they prove me wrong the third time. I just hope that the pitch is a sporting one, something which has been a rarity this season.